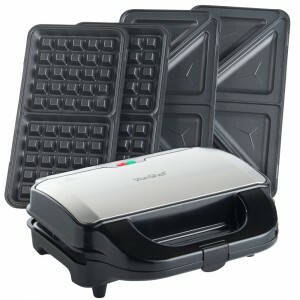 The VonShef Sandwich and Waffle Maker is the perfect addition to any kitchen. Whether you want something savoury or sweet, or are cooking for breakfast, lunch or dinner this 2 in 1 sandwich and waffle maker is fantastic. This sandwich and waffle maker is extremely easy to use. The sandwich plates are large and have deep pockets which create thick, filled sandwiches. You simply make your sandwich and turn the machine on. Once the green light is on, you can place the sandwich in the machine and close the lid, using the lock clip to lock the machine shut. The sandwiches are ready in approx. 2- 3 minutes. I have made classic ham and cheese sandwiches (which my children love!) and have also experimented with other fillings. My favourite filling at the moment is feta cheese, tomato and avocado-delicious. The sandwich plates are very easy to clean and can be simply wiped down with a damp cloth as the plates are non-stick so food comes off very easily. I have also made waffles in this machine and they too were amazing. I have never made waffles before but this machine made them beautifully. I found a recipe of waffles and then poured the mixture into the waffle plates. The VonShef machine made very fluffy, soft waffles that we all enjoyed with strawberries and ice cream. The interchangeable plates in the sandwich and waffle maker are brilliant and can be switched very easily and quickly using the plate release button. The machine has a sleek and robust black and silver stainless steel design with non-slip feet. It is very compact and easy to store so will not take up much storage space or worktop space. This sandwich and waffle machine is a fabulous addition to any kitchen and will be enjoyed by the whole family. The RRP is £24.99.